We are proud to announce a latest senior school scholarship. Offered in memory of Margaret Savage, this scholarship is available to two permanent students for the duration of their academic stage, joining from September 2019. One is available for a new boarding student, and the other for a new day student. Selection is very much in the spirit of the Citizens of the Future scholarships offered last year, looking to reflect Fyling Hall’s values and ethos. Margaret Savage was a boarding student at Fyling Hall School for some ten years from the mid 1940s . She came to our school after her mother died, her father was fighting the war in the jungles of Burma, and that was where her older brother was at school. Holidays were spent initially with her Scottish grandmother in Edinburgh, then later near London with her father’s sister, Agnes, and her friend, Esther, who had been chief education officer of Yorkshire, and knew of Fyling Hall. Margaret’s secondary school education was at Cheltenham Ladies College. However, she believed that Fyling Hall’s family spirit, encouragement of individual talent and thoughtfulness for others gave her a solid foundation for life. She now kindly offers this opportunity to two future students. The application process for scholarships involves two days at Fyling Hall w/c 11th March 2019. Candidates will spend time with pupils in their relevant year group attending academic lessons and games. They will also meet our Headmaster and undertake a short, written assessment. 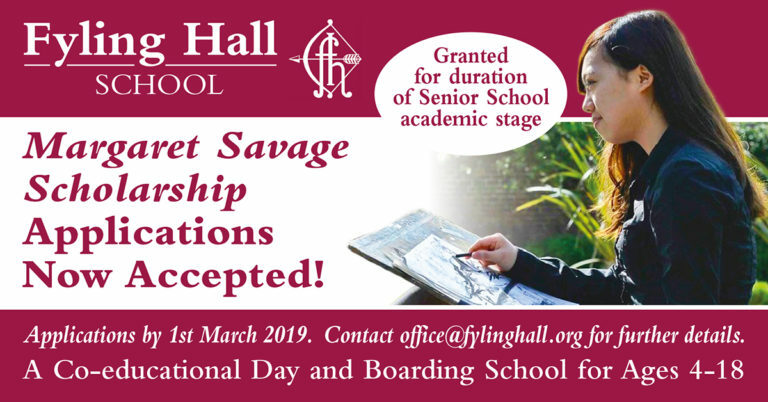 Please contact the school office by 1st March 2019 on +44 (0)1947880353 or office@fylinghall.org.